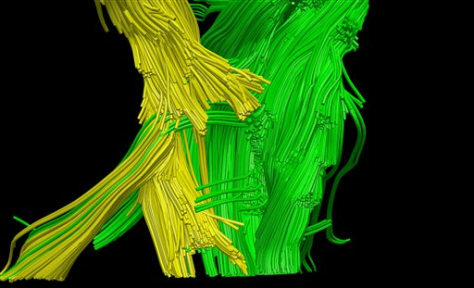 An artist rendering provided by the Schneider Lab, University of Pittsburgh shows an experimental type of scan showing damage to the brain’s nerve fibers after a traumatic brain injury. The yellow shows missing fibers on one side of the brain, as compared to the uninjured side in green, in a man left with limited use of his left arm and hand. The soldier on the fringes of an explosion. The survivor of a car wreck. The football player who took yet another skull-rattling hit.